Updated: 6:45 p.m. | Posted: 4 a.m. It's a sandbagging weekend in towns across the Red River Valley and southwestern Minnesota. In the Twin Cities, Mississippi River crest forecasts are rising. Ice jams: Some rivers see rapid rises | Moorhead: Emergency declared | Southern MN: Roads continue to close | Twin Cities: Flood forecasts trending higher | Becker: Snowblowing ... water? That's life right now in swaths of Minnesota as spring flooding pushes rivers — and nerves — higher. It might be the weekend, but for many it's no day off. Gov. Tim Walz, Lt. Gov. Peggy Flanagan and U.S. Rep. Angie Craig were among the public officials who joined Hastings residents to fill thousands of sandbags on Saturday morning. The Mississippi River at Hastings is forecast to continue rising to major flood stage over the coming week. MPR News reporters are working across the state, talking to Minnesota officials and citizens about how they're dealing with the unpredictable weather and preparing for possible floods. Here's what we're seeing this weekend. Ice jams continue to be a concern as water levels rise. The National Weather Service issued a flash flood warning for the Delano area on Friday night after an ice jam at the Bridge Avenue bridge caused the Crow River to rise a few feet. Ice jams also reportedly caused a spike in the level of the Redwood River near Redwood Falls on Saturday. Moorhead is likely to see major flooding this year and the National Weather Service says there's a small chance the Red River will rise to near the record level reached in 2009. The northwestern city has declared an emergency, and the call's gone out in the region for sandbaggers. "The good news is that Moorhead's flood preparations have been ongoing since 2009 and our completed flood mitigation projects were designed for these river levels," Moorhead Mayor Jonathan Judd told reporters Friday. Moorhead has removed 263 flood prone homes near the river since 2009. During record 2009 flood, the city used 2.5 million sandbags and built 12 miles of emergency levees. A similar flood this year would require only 150,000 sandbags and about 1 mile of emergency levee. Across the Red River in Fargo, the city has also been aggressive with flood mitigation projects since 2009. The city purchased and removed 235 homes and built 21 miles of permanent levees and flood walls, according to city engineer Nathan Boerboom. Fargo has spent $280 million on flood mitigation since 2009. During that record flood, Fargo used about six point five million sandbags to protect homes along the Red River. A similar flood this year would require about one million sandbags. -- Dan Gunderson | Moorhead, Minn. Flood impacts will increase dramatically over the next 72 hours in southern Minnesota as rivers rise steadily. Many rivers will reach Top 10 floods of record next week, says MPR News meteorologist Paul Huttner. In southwestern Minnesota, sandbagging efforts are underway in Windom, part of an effort to protect city infrastructure from the floodwaters of the West Fork of the Des Moines River. Dozens of high school students from Windom and nearby Mountain Lake were filling sandbags Friday. "Quite an accomplishment, and you know I think it's just great for the kids. They really took advantage and provided public service for us, and we're really proud of that," said Windom Mayor Dominic Jones. Jones says the river flooded after heavy rain last summer, but this is the first time in years that Windom has seen spring flooding. 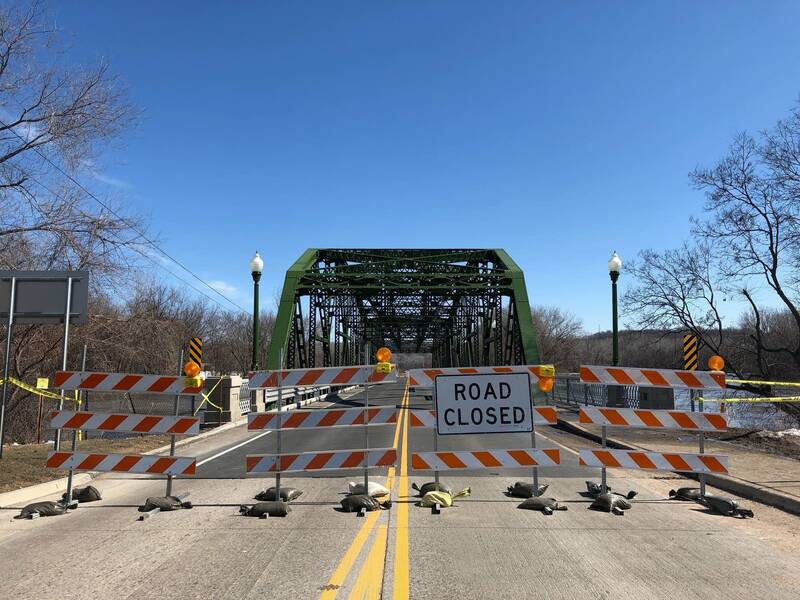 The Minnesota Department of Transportation's anticipating lane restrictions over the weekend on U.S. Highway 169 from St. Peter to Le Sueur due to rising forecasts for flooding on the Minnesota River. Hwy 169 St. Peter - Le Sueur - Heads up that MnDOT will be putting lane restrictions in place (But the road should remain open) due to a rising forecast on the Minnesota River. Check https://t.co/OAq7yc361o and Safe Travels! In Albert Lea, in south-central Minnesota, the water continues to rise on Main Street. Updated flood forecast numbers now estimate the Mississippi River will reach 19.9 feet in St. Paul by next Friday. That level would mark the eighth highest flood of record on the Mississippi at St. Paul, the highest in nearly 5 years, according to MPR's Huttner. A "big bubble of water flowing down the Minnesota River is heading for the Mississippi at Fort Snelling. That's one reason flood forecasts are moving higher," said Huttner. "The rivers are likely to stay high for several weeks this spring," he added. "That means rivers will be vulnerable to heavy rain systems in the coming weeks. The Minnesota River's creep will force a closure Sunday night when MnDOT shuts access to Black Dog Road from northbound Interstate 35W in Burnsville, starting at 8 p.m.
MnDOT said crews had already planned to close those ramps in early April to complete work as part of the I-35W Minnesota River Bridge replacement project. The Minnesota River at Jordan is in moderate flood stage and is forecast to continue rising this weekend, the National Weather Service says. Give them credit. MnDOT crews had been working much of last week to get water off the road and reopen all lanes of U.S. Highway 10 near Becker. They tried a new tactic last week, stopping traffic for short periods using a big snowblower to rid the ditches of ice so the median could drain. It worked. MnDOT was able to open all lanes. Creative thinking could be at a premium in the coming week as the waters continue to rise.